Love this backpack! This goes to work with me daily carrying my laptop and work essentials through blocks of the skyway system. It rolls better than the expensive rollerbag briefcase I was using and it's much more fun in the leopard print! Would definitely purchase again! Take a load off and keep going with the convenience offered by Rockland's Leopard 18-inch rolling laptop backpack. It includes a two multi-use side mesh pockets and one fully padded laptop/notebook computer pocket. I wanted a computer case big enough to carry a 15" laptop plus accessories for work. It has the right number of slots and pockets to store cords, pens, a pad of paper, my purse, a lunch bag, plus the computer. The only thing that's not perfect is that the water bottle pockets are a bit too short - a juice bottle fell out on day 2. The unit rolls smoothly, even over stairs and uneven pavement, and feels sturdy (even better than my previous PC backpack that lasted 8 years). The handle is adjustable - I am 5'3" and both the short and long handle settings work for me. The straps can be tucked inside so they don't drag on the ground when rolling. The leopard print is subtle, kind of dark, classy. I am very happy with this item. I am replacing my own bag that I had for about ten(10) years. This bag is light enough, wheels are spaced well apart to keep it from twisting while you roll it. There are many pockets and places to put office equipment as well as my lunch. You can turn it into a backpack, but you can also hide the backpack straps. Very nice. Just what I needed. Even though it's a little long when placed under the seat, it counts as a personal item. Roomy enough to pack computer, toiletries and a few small items for a flight. I have a 17 " computer that fits in the pocket, but the velcro strap doesn't fit. I haven't been able to find a bag for my large laptop, but this one works well enough. This worked great as a large carry-on for my last trip to Europe. I used this as my overhead carry-on piece, while I toted a smaller backpack to keep at my seat. It's large enough to carry quite a bit of stuff, but small enough so as not to take up an obnoxious amount of room in an overhead bin. Since I packed the heavier items toward the bottom and rear, it didn't lean as other reviews mentioned. Love that it came with straps so it was versatile -- there were times I preferred to roll it, other times I preferred to sling it over my shoulder. 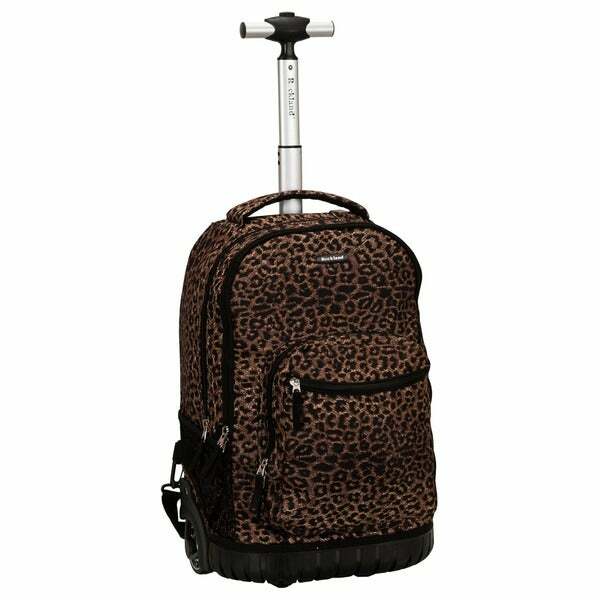 I had been searching for a leopard pattern lightweight rolling backpack that I could use as a carry-on. Finally found it on Overstock.com. When it arrived, I was pleased to see the excellent quality, and noted that it was even roomier than I expected. I haven't used it yet, but look forward to using it for upcoming trips! Looked great, wheeled smooth...but after a few months the wheels went and the handle broke off...Just couldn't handle the daily grind. So glad I found this bag! It rolls without any issues and was the answer to no more back/hip issues with carrying a laptop backpack daily. This backpack is very roomy. When you are rolling it, this backpack is very stable. No problems with it flipping from side to side. Very sturdy. I am very happy with this purchase. Perfect size and well constructed, pleased with my purchase! I wanted a roller bag that doubled as a backpack for work. The wheels didn't work very well so I ended up carrying the bag on my back. It held for a while but eventually got a hole in it. Excellent quality! After a year and a half of hard, daily use, every part of this backpack is still in PERFECT condition. I love this backpack. It is well made and looks great. Very functionable. I would purchase again and again. It does great on the NY streets and subways. inner lining tore rather quickly. It is perfect for the gym. "How long does the handle extend to?" Hello tnrmom, the handle for this backpack extends to approximately 20 inches long. Have a great day!